Members of the Minnesota Freeze (blue jerseys) try to advance the ball against the Houston Lonestars during the United States Australian Football League Central Region Tournament held Saturday at the SCORe soccer fields in the Franksville area of Caledonia. Twelve teams from across the country participated in the tournament. Members of the Minnesota Freeze (white jerseys) and New York Lady Magpies fight for control of the ball during the United States Australian Football League Central Region Tournament held Saturday at the SCORe soccer fields in the Franksville area of Caledonia. Members of the Minnesota Freeze (blue jerseys) try to wrest the ball away from the Houston Lonestars during the United States Australian Football League Central Region Tournament held Saturday at the SCORe soccer fields in the Franksville area of Caledonia. The only way to advance the ball in Australian rules football is by kicking it or hitting it like an underhand volleyball serve. CALEDONIA — To the uninitiated, Australian rules football, or "footy," might at first seem like someone took the rules for several field sports and put them into a Magic Bullet juicer. In fact, Cory Malchow, a backfielder for the Milwaukee Bombers of the United States Australian Football League, describes the game as having elements of volleyball, hockey, rugby, American football, soccer, basketball all rolled into one. “It’s a very, very fast-paced game. 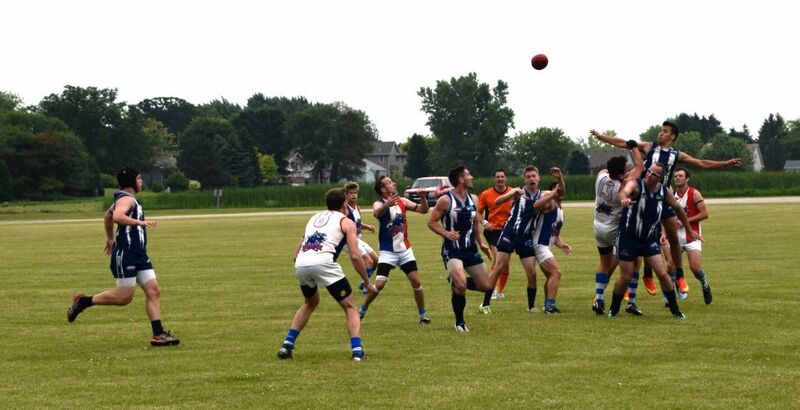 It has a little bit of everything and it’s for everybody,” said Malchow, whose team was among the 12 teams participating in the USAFL Central Region Tournament on Saturday at the Soccer Complex of Racine (SCORe) in the Franksville neighborhood. Teams came from as far away as Colorado, Texas and New York. There weren't a whole lot people watching the matches (which started at about 9 a.m. and were expected to run past 5 p.m.) who were not connected in some way to the participating teams or the USAFL. But Dave Blank, president and CEO of Real Racine, the county's tourism bureau, was still happy that the organization was hosting the event. Blank said having the teams in town over the course of a couple of days would have an estimated economic impact of $200,000 on the local economy. Blank said participants were telling him about where they went for dinner and drinks on Friday and tournament organizers were planning on having a post-tourney party Saturday night at the Route 20 Outhouse in Yorkville. Blank said he was hearing a lot of praise for the SCORe facility, which was able to accommodate three Australian rules fields, which are oval in shape and are 200 yards long by 150 yards at their widest point. Malchow said that among the participants in Saturday's regional tournament were men's and women's teams with players ranging in age from 18 into their 60s. With 18 players per team on the field for 20-minute periods and no limits on substituting, having enough players on hand can be a challenge. In fact, Malchow said the Milwaukee Bombers male team didn't have enough players and had to pool resources with the Indianapolis Giants, which were in a similar roster predicament. The key provision in Australian rules football is to keep the ball (a bit larger and rounder than an American pigskin) moving. But the only way to do that is to kick it or punch it forward like a volleyball serve, Malchow said. Blocking is allowed from a distance and tackling can be done around the mid-torso only, Malchow said. Those are just a few of the game's features. In fact, in the Bombers' first match of the day, the Bombers lost to the Tulsa Buffaloes, 54-1. Malchow said the Milwaukee Bombers are always looking for new players and experience is not required. The team holds practices most Saturdays at 3 p.m. at Veterans Park, 1010 N. Lincoln Memorial Drive, on Milwaukee's lakefront. That's just south of the kite concession, Malchow said. • Whoever scores most points wins. yeah !....would have been nice to see this !!! way to let people know about it AFTER it happened!